I’ve come across this sentiment or something like it quite a few times, and I think it’s actually not true. So why not blog on the subject? It does seem, at times, that philosophy is sort of ‘stuck’. Obviously it changes, in what positions are fashionable, and who’s quoting whom at whom regarding what, but does it make substantive progress? Can we point to ‘advances’ that philosophy has demonstrably made, contributions it has made to human knowledge which aren’t just a trading-in of old prejudices for new ones? The first and most concrete thing that comes to mind is, unimpressive as it may seem, a collection of instructive failures. Its history is filled with bold experiments, and the records of what went wrong – each of which tell us something significant. For example, we now know that if we suppose all knowledge and all concepts to be derived from experience, we will find it very very hard to justify even simple reasoning procedures like “if it hurt every time I did it so far, it will probably hurt next time as well”. We know that because incredibly smart people committed to that very supposition have spent their lives trying to do so, with little success. And I don’t think that this was known in the same way in centuries before that, because the problem hadn’t been raised and considered in the same way. Of course not everyone agrees, and people will always have a new attempt to revive apparently dead options – but there is at least a consensus that certain positions face certain, apparently serious, problems. 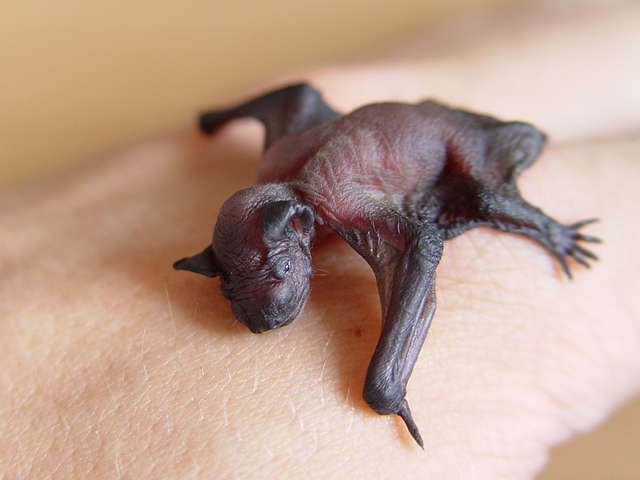 Poll: is this baby bat cute? I posted a few things a while back on analysing disgust philosophically. Some emotions have got plenty of attention like this from philosophers, especially love. But something that I’ve never seen discussed in the literature is cuteness – what is the content and the meaning of our perceiving things as cute? A google search brings up nothing but people naming their cats Socrates and Nietzsche. So I’m going to have a go. The obvious thing people say when analysing cuteness is that it’s an evolutionary adaptation to facilitate care for infants. This is quite true, but it doesn’t answer the question. What is a mouse or a bear or a human actually conscious of when they perceive their young in this way? They can’t really be conscious ‘that the infant is theirs and is very young’, because they probably don’t have enough sense of self-identity, or of time, to understand such concepts. Besides, how young is young? It’s a different space of time for different species. So merely knowing why this reaction came about doesn’t tell us what its content is. Third post of fairly heavy philosophy. Will try to balance it soon with some political polemic and possibly a post on the philosophy of cuteness. In my last post, I tried to explain why I think that empathetic ways of thinking of other conscious persons, and their conscious lives, is not just a different feeling or motive added on to non-empathetic ways of thinking, but is cognitively different, i.e. a completely different sort of belief. I’m really not sure how far I managed to do that, since thinking about how we think, and especially thinking about how we think about thinking, is hard. But in summary: in non-empathetic thinking, the object of our thought in the other person, while in empathetic thought, our object is actually the object of their thought. E.g. if person X is frightened of thing Y, then my coming to believe this involves a thought directed onto Y, not onto X. Just as ‘I’ am present in the thought, but not as an object, so X is not present as an object, but as a viewpoint, a perspective on the world. Anyway, rather than spilling any more words I’m going to assume that if people still have no idea what I’m talking about they’ll tell me. What I want to talk about now is why, given that empathy and all the forms of non-empathy are different cognitions, one is true and one is false. None of these arguments is entirely knock-down, because the whole debate is so loose you’ll always have room to dodge any point. But to me they make a lot of sense. (I like the idea of a non-empathy umbrella too – empathy for other people is like rain, i.e. messy and inconvenient but also pervasive and vital for life). In my last post I tried to lay out the ground for my approach to meta-ethics, that is to investigating what is involved in moral claims being true or false. Today I’m going to try to put flesh on those bones by developing an account of how it is that we think about other people and their experiences, on which empathy is rationally required, and people who behave like psychopaths are rationally defective – victims, so to speak, of a delusion, just as much as any other psychotic. 2) People with different affective and motivational components can still share the same cognitive components. That is, if malicious person A and compassionate person B both observe person C in distress, they can share the exact same cognition – namely, awareness of the fact ‘that person C is in distress’. They differ simply in that A adds to this a layer of enjoyment and a motivation to keep watching that distress, while B adds a different affective component (they are distressed themselves) and a different motivation (to relieve C’s distress). What this picture implies is that at the level of cognition, there is no difference between A and B – and so neither can be called right or wrong. They differ only in the further steps they take after becoming aware of this fact. What I want to argue is that for these affective and motivational components to differ as they do, A and B must also have different cognitions, i.e. they believe different facts. How does this work? My essential claim is this: that A is thinking of a certain object, which they understand and predict by running through a series of thoughts, treated as fantasy-thoughts, while B is thinking of a viewpoint embedded in a body, from which the world appears a certain way. Last post I mentioned being away for the period around the weekend – I was at a philosophy conference and got back yesterday. The paper I was presenting was on meta-ethics, and in particular the topic of how moral claims might be objectively valid. I won’t paste the whole thing up here, and I may not even put a whole summary up here (though if not I’ll try to complete it in other posts). But since it’s a topic I find abidingly interesting, and that has on occasion come up in discussions, I did want to open up some sense of what I’m about. My starting assumption is that the content of any correct moral system is, boiled down, caring for others in the same way we naturally (though not inevitably) care for ourselves. The basic idea is to look out for the intersts of others as we do for our own, and in particular to refrain from harming them, just as we would try to avoid harm to ourselves. I certainly don’t think all moral systems ever have fitted this pattern – many have substantial alien parts (purity, obedience, and group loyalty are three prominent values that seem opposed) – though it’s rare to see one that doesn’t incorporate this element among others. But that’s fine – they’re just wrong! Now, what’s striking is that this sort of care-for-another isn’t restricted to what we would call ‘morality’ – it’s also something that often occurs spontaneously, when we simply learn about or consider other people, and of course something that occurs much more reliably in many sorts of inter-personal relationships. On the other hand, sometimes we don’t. Sometimes we know that someone is being hurt by our actions, and just don’t care. Sometimes, moreover, we perform that action because it hurts someone, because we are motivated to see them unhappy. How do these phenomena differ from the moral? One difference is that they usually have more of a ‘feel’ to them – we empathise in a way that makes us cry or smile and which generally seems ’emotional’. But this isn’t actually always the case. Often in relationships, we act to care for someone but don’t ‘feel like it’. We can act as though we empathised, but without actually going through the experience of empathy – not necessarily out of ‘duty’ (in the sense of something ‘moral’) but becaue we value the relationship – we value it, and this motivates us in a constant way, regardless of the temporary variations in our emotions. Remembrance Day: What exactly do we remember? This is a lazy post, in fact a year-old repost from before I started this blog, that I thought readers might find interesting. It’s explictly a moralistic sort of piece, not a political analysis (no war but the class war! etc). To listen to most endorsements of remembrance day, and to most poppy-related appeals for money, one would be forgiven for thinking that the job of a soldier was to die. It is not: the job of a soldier is to kill people. Those people fall into approximately two categories: firstly, civilians, and secondly, other soldiers. The number of dictators, politicians, generals, etc. who are killed by soldiers is negligible. It’s true that courage was not uncommon among the armed forces, and that many (though probably well under half) of the last century’s fallen soldiers were fighting for something better than what they were fighting against; it’s also true that most responsibility the blame for the horrors of war lies with high-level decision-makers – and the average soldier is usually in a situation of very limited freedom. But people are always free and people who kill are responsible for deaths, even if others bear equal or greater responsibility. Consequently it seems ridiculous to look on soldiers with an attitude only of praise, and not utter a word of blame or condemnation. That condemnation should be limited by the very limited perspective, the limited power, the limited opportunities, of average soldiers – but it cannot be simply dropped altogether. Of course there is huge variation among individual soldiers, ranging from the truly discriminate soldier who shoots only those shooting them, and fights only for good causes, down to those who participate in irregular massacres – to deny this variation would remove the whole point of speaking of freedom. What is wrong is to ignore the whole issue, for this imputes to them a uniform purity. It occurred to me in a recent conversation that although I consider myself an environmentalist (whatever that means), and although I am abidingly fascinated by life and its various forms, and committed to the idea of ‘respecting’ a fairly large class of them, I’m not really comfortable talking about ‘nature’, or putting points in terms of ‘nature’ or ‘the natural world’. You and me, baby, ain't nothing but mammals. In fact, I don’t think I believe that such an entity exists. Let me put it like this: the way the word ‘nature’ is often used, it seems to be supposed that visiting a Caribbean coral reef and swimming with dolphins, visiting a Tibetan mountain to photograph eagles, and and camping in a pine forest in Norway, are all ways of having contact with ‘nature’. This almost suggests, though, that when I get to the eagles, I in some sense am more familiar with them because I met the dolphins, and when I am in the forest I’m closer to it because of being in the mountains. That is, it suggests that there’s something in common between the three. But there isn’t – the coral reefs are as foreign to the mountains as they are to the heart of London. Dolphins have as little in common with eagles as they do with humans. When I turn up in the forest and disturb some bear, it will not care in the slightest that I am on good terms with the frogs of Indonesia. All that is common is something negative: they are areas that are not heavily populated with humans. Note, it’s not even that they’re therefore populated with lots of other species – because 1) there’s no definition of ‘populated’ that puts coral reefs in the same league as mountains, and 2) cities, the paradigms of human settlement, probably contain more non-human animals than many remote ‘wild places’. So the word ‘natural’ means something like ‘alien’ or ‘foreign’: it’s not something that applies to things themselves, but rather characterises our relation to them. Things are different from what I’m familiar with – and this I designate by calling them things like ‘foreign’ (when I’m focusing on nationality) or ‘nature’ (when I’m focusing on species).